I hesitate to write about Lumpy, I grew up spending my summers in Estes Park and started my climbing career 7 years ago at Lumpy. Since then, I have seen it grow immensely in popularity and is headed the way of Eldo (i.e. crowded as hell); however, this growth is mainly from the weekend warriors, on the weekday climbing is more reasonable. Lumpy is awesome, the climbs are moderately long, two to five pitches on average, and take place in a spectacular setting with views of Longs and RMNP. The climbs are spread out on a number of unique formations, the most popular being The Book. Sundance, far at the end of the ridge, is the tallest cliff at 700-800' and has awesome classic climbing with a long approach that deters the lazier climbers. Magical Chrome Plated Semi-Automatic Enema Syringe (5.7, this is a good, although not classic climb), Batman and Robin (5.6, great beginner climb or first lead), White Whale and Hiatus (5.7, totally classic), Kor's Flake (5.8, longer route), Osiris (5.8, you will either love or hate this "wider" climb), Melvin's Wheel (.8+, great climb), Pear Buttress (.8+, best 5.8 on the Ridge), Cackle Crack (5.8, short). Climbing in the 5.9-5.10 range opens up tons of classics, these are a very few. J-Crack (.9, spicy with a runout 5.8 traverse, time tested classic), Loose Ends (.9 awesome), George's Tree (.9, very typical Lumpy climbing), Mainliner (.9-, DO THIS CLIMB), Orange Julius (.10a, varied climbing), Climb of the Ancient Mariner (.10a classic face), Fat City (.10+ famous classic, a sandbag), Cheap Date (.10a) and Outlander (.10+), great finish to routes like Pear Buttress and J-Crack ), Gollum's Arch (.10a, sandbagged and sustained with many different sizes on it). In the 5.11 range, almost every route is good, yet many are tricky to protect as they are thin seams and faint features. Stretch Marks (.11a, a little scary), Living Dead (.11b, very finicky protection), Backbone Arete (.11c, a well bolted yet very hard slab), Finger Lickin' Good (.11a), Corner Pump Station (.11c). I haven't done these two, yet they, obviously belong on this list. For those with minimal time to spare, Little Twin Owls has good toproping with a classic Finger Crack (.11) that should not be missed. There is good bouldering just before Little Twin Owls, and just after the turnoff for The Book. Two good routes for the solid .10 trad leader are on Checkerboard Rock, a fifteen minute approach. These climbs are Ziggy's Day Out (.10+) and Checkerboard Crack (.10b), both these routes are short and require a lot of skill at placing pro. Checkerboard Crack is classic Lumpy climbing, flared, insecure, sustained, and very hard to protect. Take US 36 to Estes Park. At the intersection of US 36 and US 34 in Estes Park, turn North onto E Wonderview. Pass the Stanley Hotel on the right, then turn right onto MacGregor Ave., which becomes Devil's Gulch Rd. at a sharp bend right. 1/2 mile later, turn left onto Lumpy Ridge Rd. (there's a good sign for this), and park in the lot at the end. The new trailhead will be located east of the Twin Owls Trailhead just off MacGregor Ave. The gravel access road lies just west of the Gem Lake Trailhead. This will result in an additional 0.7 miles to formations west of Twin Owls. This will shorten access to crags east of Twin Owls. Happy hiking. There appears to be a line of cord uphill/north of the old Black Canyon Trail. It is likely the new trail location as part of the changes to be made with the land deal swap/reversal of easements (which includes the new parking lot to the east). Now, the fences have moved (as of 2009). There is a new, 100-car, paved trailhead for Lumpy Ridge. The old Twin Owls trailhead is in the process of being reverted closer to its former state. The new trailhead adds on 0.6 miles to routes from Twin Owls and west (Batman, Book, Pear, Sundance, etc.) 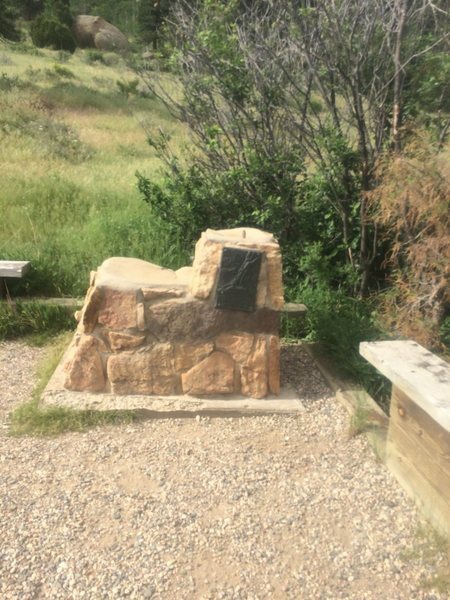 Note, for those new to the area, the trail listed as Black Canyon Trail is used to access The Book, The Pear, Sundance etc.) The water source at the old Twin Owls lots is still on as of 7/07. This was called Thataa-ai-atah by Arapaho Indians which means "little lumps". No dogs allowed off the pavement. It is a National Park. View of the park from the Book area. The Whole West End of the Shootin' Match. Lumpy Ridge during a rainy sunset. Lumpy Ridge. Photo by Blitzo. Small granite arch at Lumpy. Elk and horses-Lumpy Ridge. Photo by Blitzo. Evening walk back after the climb. The view from The Book on 3-31-12. Sunset over Sundance and Batman Rock, 7-28-2007. Twin Owls and autumn gold, Lumpy Ridge, Colorado. Who knew one could be so serious about "Who new"? Lumpy Ridge from Trail Ridge, 7/25/09. A good day of climbing. Lumpy Ridge-Bookend Area. Photo by Blitzo. Yes, even cacti like it here! Don't overlook the bouldering in the area! The Book. Photo by Blitzo. Twin Owls. Photo by Blitzo. 2) #2 Ed's Cantina. Enough said. 3) If you think it is too crowded...try hitting the full moon in warmer weather. Take a headlamp and enjoy. I have yet to have to wait for anyone. I don't believe there are plans to begin the move until fall 2003, subject to funding. As someone who does a bit of rebolting work with the ASCA I would just like to say that Greg, Chris, etc. run a very ethical organization. I can tell you first hand that people like Greg, who probably replaces 100-200 bolts, or more, per year, is doing this gratis. Luckily his girlfriend has a truck since his truck has had a blown head gasket for a long time. And, not to downplay the efforts made in rebolting single pitch routes, the ASCA has been responsible for rebolting many multi-pitch routes in areas such as Yosemite and Red Rocks. The amount of effort to drag all that gear up many, many pitches and climb then re-bolt routes is staggering. It makes big wall climbing seem trivial. Please do not stop contributing to the ASCA because of one bad apple. Greg, Chris, et al. are doing a great service to the climbing community. It is a thankless job that is in need of your support to keep it happening (www.safeclimbing.org). First of all Eli is out of town and probably would like to be part of this discussion. I will leave that up to him and to respond to the bolt issue on the parking lot rock. As far as the route King Tut goes- I drilled the one protection bolt that is on the slab 1/2 between Ramses and Cat Dancing. The route is a little bit of a sqeeze but is a great route and to climb it directly without the bolt would put the leader into ledge fall territory. I tried to lead it group up but backed off. WE cleaned much rock off of the overlaps, much of it being very loose and poorly protectable. There are some other overlaps to the right but still to the left of Ramses that Jason may have climbed or he may have climbed the same route. The fact that we claimed a new route may have been premature and if you have climbed this entire route prior to 3/04 let this site know and you can name it., grade it etc... chop the bolt if you think it is unessecary. Just trying to get cool new routes up! As far as the anchor goes. It is a convenience anchor. I see no problem with that. 99% percent of the bolted anchors at Lumpy are convenience anchors. One could always climb choss to the top and walk off. Or rap off slings around horns that litter the area and are eye sores. (I know bolts are eye sores to some, but generally they are considered lower visual impact) If you want to jump on a band wagon, jump on one that is going to allow the park to build and brand new trail only 300 feet above the exisiting one. The previous post is an imposter, [Eds. it has been deleted] FYI I have returned to Summit County for the winter and have not had a chance to chime in for a while. I also just had knee surgery last Tuesday so will not be able to climb for a little bit. I do however know of the arete that the fake CC is talking about and I too believe this would be a great clip up pretty close to the car, well I guess it used to be close to the car. Hey fake CC, get some bolts in that thing, it is a pretty sweet line. May I suggest top roping it a bunch first and then talking to Laurence Stumpke about the best place for the clippies. He has a good eye for bolting aretes. Hello to all the Estes Folk, and I hope you are having fun in the snow. I'm on the RMNP trail crew and the new lot is still to open Memorial weekend, as long as the weather accommodates the pouring of the lot tomorrow. A few other things to clear up, the new trail is officially 0.7 miles long, I just GPS'ed it for the park. The fencing and gates are also being reconstructed; this should help with the wandering cattle. You are invited to join other climbers, and first ascensionist, of past and present, and other lovers of Lumpy Ridge to celebrate a half century of climbing at Lumpy Ridge, Colorado. The festivities will be held the weekend of October 1st through 3rd . Details are attached. We hope youll join us for a weekend of activities on Lumpy as well as in Estes Park. Details are attached. This is the tenth (yes 10th !) straight year of partnership with Rocky Mountain National Park and stewardship of the climbers access trails. Lets make this a fun and memorable Decade in the Dirt. Over the last ten year we have provided over 500 participants and 4000 hours of service work on Lumpy Ridge. These are not your tourist trails but the steep, narrow and rugged climber access trails to each of the crags we enjoy. Destinations include: Sundance, The Pear, The Book End, Book Mark, Left Book and Book, Batman and the Twin Owls. Some of these access and descent trails are 800 vertical feet in length. Some now have over 60 wood water-bars and 100 stone steps each notched into place to prevent erosion and improve the hike. On Sunday, October 3rd well begin the day by staging at the Estes Park, Town Hall parking lot at 7am. Breakfast and lunch are provided for all volunteers. In celebration of over 50 years of climbing on Lumpy, Id like to invite you to come on Friday and/or Saturday also, and join the energetic group for cocktails, dinner and a slide show by Author and compulsive first-ascensionist; Scott Kimball. From the late 1970s to the mid 1980s Scott put up over 50 new routes on Lumpy Ridge and penned two guide books. Many of us found our way around the Ridge using the blue stars book for over a decade. Scott will provide warm stories and a viewing of many of those routes on Saturday evening at the Estes Park Museum, at 8pm. There will be a social hour starting at 6pm followed by a full-spread buffet dinner starting at 7pm. For dinner reservations; please pay $20 in advance by PayPal. (Same for Credit card) atpaypal.com, use the Send Money tab, and Send Money Online to this email: ekreis@americanalpineclub.org for the Lumpy Dinner. Other inquiries and questions can be sent to Section Chairman Chris Pruchnic at 303-809-6783, haliku@yahoo.com, or event coordinator Greg Sievers at g_sievers57@q.com. Each year, Rocky Mountain National Park initiates temporary closures in certain areas of the park to ensure birds of prey (raptors) will be undisturbed during their breeding and nesting seasons. Closure notices will also be posted at key access points in the park. As breeding and nesting data are collected, additional closures may be necessary, or closures may be lifted. Areas not listed above are presumed to be open. These closures will be lifted or extended as conditions dictate. Closures include the named rock formations and the areas extending 100 yards surrounding the base of the formations including all climbing routes, outcroppings, cliffs, faces, ascent and descent routes, and climbers access trails to the formations. The Alligator Rock closure includes areas extending 200 yards from the base of the formation. What's the current weather and snow cover like at Lumpy? Planning a trip in two weeks and hope to get some climbing in there. Could you please delete your 11-year-old first paragraph in your description of Lumpy Ridge? Lumpy doesn't deserve a negative introduction. In my opinion, it has been well maintained, is accessible, and doesn't suffer from overcrowding. I live in Estes Park and was thinking about my weekend plans and had forgotten about the road closures up here on Saturday for the pro bicycling race. I glanced at a few links and maps, and on the NPS RMNP page it mentioned that Lumpy Ridge and RMNP access will be shut down most of the day. Climbers will probably want to know this. in looking at the map, I think that access to the Monastery will probably be closed or limited as well. Basically, all kinds of stuff around the Estes Valley seems like it'll be a mess on Saturday. I tuned out after looking at it a little bit, and figure I'll just stay home and work Saturday anyway -- I'm buried in deadlines. So, I don't know a lot about it, but your site's viewers might find it useful. Figured I'd email you and let you know, in case you wanted to announce it under "climbing news" or something. Or would the forum be a better place for it? I'm swamped right now and thus kinda didn't want to hassle with posting in the forums, and then dealing with questions (and accusations and insults, ha! can't imagine it, though it is a web forum, and it seems it takes about one page before the name calling begins :) ) or anything that follows -- I don't know anything more than what I quickly perused online, just figured that people would want to know about it. If it's best for me to just post it in the forum, though, I can do that. I'll just copy-paste this. Lost keys bouldering either in the Twin Owls, lower Twin Owls, Pear Boulders, or somewhere in that direction. Toyota key with an orange carabiner. Please contact me with any info. Thanks! 15 years after its inception, the tradition continues. Sundance was the first trail we set our sights on, but 15 years of erosion have taken their toll. Please consider joining the efforts. Water fountain seems permanently removed. I walked by it during winter, and it was still a fountain but not on, which is expected in winter, but today I walked by and the hardware was no longer there and it was cemented over. Sadness. Lumpy Ridge - end of the water fountain.